When Diane of The W.H.O.L.E. Gang announced she was hosting Go Ahead Honey, It’s Gluten Free, with the theme Scared Silly: food that we were scared to try, but really had no reason to as soon as we tried it (and liked it), I wasn’t sure. To my knowledge, I’ve never been afraid to try anything; add to that, there’s hardly a food I don’t like. It’s effort to think of foods I don’t like. But when I started thinking of food that I like or love, in an unfamiliar context, then I started to think. The first thing that came to mind was avocado in chocolate: while I’ve expressed enthusiasm to try it many a time, warming to the idea of using it as a replacement for cream in recipes, I just didn’t do it. So far it was just all talk, but no walk – I decided to change that. And with that said, make this my Halloween post for the year. Scoop out the flesh of the avocado, throwing away the skin and pit (unless you want to try to grow an avocado tree…?) and puree with the honey and cocoa powder in a food processor. Add coconut milk and puree again to mix. If necessary, adjust the sweetening to your taste. You could also do this by hand, mashing the avocado until it’s a smooth paste and mixing with the rest of the ingredients in a bowl. Cover and refrigerate. 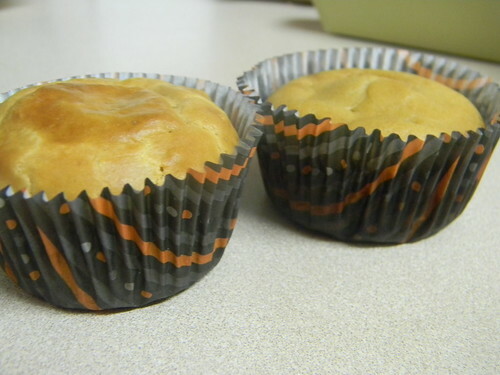 Preheat oven to 350ºF and line a standard muffin tin with paper cupcake liners. Version #1: (with custard) Blend the rice flour and cornstarch together in a bowl. Form a well in the centre of the flour with your hands. Crack the eggs into the well and whisk with a fork to break up the yolks with the whites. Add coconut milk, custard, extracts, and honey, mixing while drawing in the flour blend until all the ingredients are completely mixed. Add salt and baking soda. This batter will be similar to a very thick custard in consistency. Version #2: (without custard) Blend the rice flour and cornstarch together in a bowl. Form a well in the centre of flour with your hands. Crack the eggs into the well and whisk with a form to break up the yolks with the whites. Add coconut milk, extracts, and honey, mixing while drawing in the flour blend until all the ingredients are completely mixed. Add the salt and baking soda. Bubbles will start forming on the surface, unlike the version with the custard. The consistency will be a thick, smooth consistency. Spoon batter into the prepared muffin cups, filling halfway full. Bake for 16 to 18 minutes or until a toothpick or cake tester inserted in the centre comes out clean. Cool for 5 minutes in the tin, then transfer cupcakes to a wire rack to let cool completely. Once room temperature, ice with the chocolate cream icing if you choose to. Enjoy! Your cupcakes look yummy Zoe! I will have to try these with a couple of flax eggs! Heidi, I’d be excited to see how the cupcakes turn out for you with flax eggs! I love the idea of avocado icing. I tried avocado chocolate mousse via Sea at Book of Yum whenMa was sick last time. I ended updating it and then later frozen as bonbons. Fabulous! I couldn’t believe how good it was. So, I have a feeling it would make a great icing, too. I love how reading all of these blogs from healthy people is making me more healthy. Thanks so much. Tia – Mm, avocado chocolate mousse sounds good! I’ll have to find that recipe and check it out. The idea for updating is as bonbons also sounds fab. Thanks, but that was another typo. It was supposed to be… ended up eating it as bonbons. It was actually Sea’s idea. Don’t want to take the credit for that one because it was really good. I’d feel like I was stealing. I too like the idea of avocado in chocolate recipes. Glad you’ve tried it! You inspire me to do the same. I like your version of the cupcake recipe too! Thanks, Alta! Yes, I had slight trepidation as I started to whiz the avocado in the food processor – would this really work? – but I need never have feared. There’s no avocado taste at all, in fact I’d go so far as to say that the icing tastes like the best flourless chocolate cake I could have, should I figure out how to transform it into such. It’s so creamy! You’re the bestest sister ever! I love your icing. I like to make avocado pudding and use it as icing too. It’s pretty darn yummy. I’ve been working on a dairy-free and egg-free vanilla cupcake. They’re nowhere near as white as yours! I wish they were – there’s something about that white cupcake! I added coconut sugar and it just didn’t work out. They tasted yummy but they’re not as pretty as I was hoping for. Maybe I’ll try honey like you did! Aw, thanks so much, Maggie! 🙂 Now that I’ve put one foot in front of the other, so to speak, I’m really excited now to try using the avocado in place of cream in recipes, such as in a pudding or mousse. There’s actually a Martha Stewart one I’d like to give it a whirl with, which I made years ago with dairy. Best of luck with your dairy-free/egg-free vanilla cupcakes! I have a feeling that these ones could be made egg-free pretty easily – omitting the custard, though, since that is made with eggs (no idea how to sub them in that instance) – but I didn’t have the time to test it before the GAHIGF deadline. If you or Heidi, or anyone else, makes these egg-free before I do, please let me know how they worked and if you did anything else to modify it. Oh, also, – my brother ate most of the icing, in fact finished it last night, and this was after I cautiously told him I’d made it with avocado. He was very enthusiastic about the idea and started telling me all about how people could use avocado instead of dairy to make things dairy-free. It was sweet! I was even more relieved that he still liked it since he hadn’t eaten avocado before and had refused to try in the past. It is so funny because people never even know that there is avocado in it when they try it and I am like you and just do not tell them. I cannot wait to try this icing! What a great great idea to use it this way! Wow Zoe, those cupcakes look amazing and so unique. The textures of both the cakes and the frosting look different from “ordinary” cupcakes, yet I can tell by the ingredients, they probably taste even more amazing! Hi Alisa, thanks! 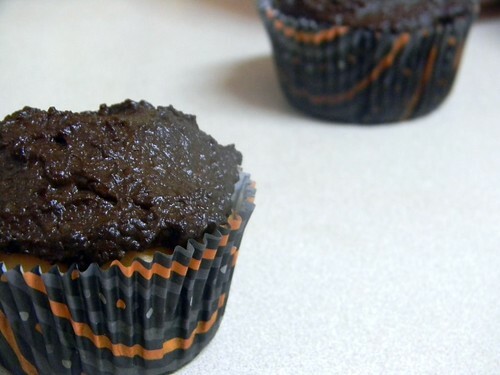 I think the chocolate frosting just adds that little, extra dimension and compliment to the cupcakes, though the cupcakes are great also on their own. Plus, I like that the cupcakes are pretty quick to throw together. Hi Jenn, thank you! Key lime pie with avocado sounds intriguing! Does it affect the flavour in any way, or does it just contribute creaminess and the other ingredients just mask the avocado? I’d be interested to try it out sometime. I would never imagine to put avocado in anything sweet, hehe. This is certainly an interesting idea. But I don’t think i’m adventurous enough…although maybe one day.